Every May since 1946, the most famous and the most prestigious film festival in the world starts in a small beach resort of Cannes on the French Riviera. Even though there are signs that the festival’s importance is waning a little, this is still the festival in the world of cinema. 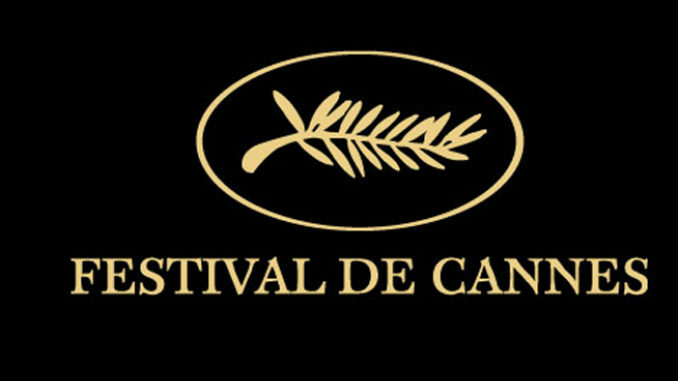 What people call “Cannes Festival” could actually mean very different things to different people because there are several events happening at the same time, each of them distinctly different from each other. “Being at Cannes” may mean attending the festival itself, or buying and selling movies at the film market, or possibly participating in one of hundreds of activities taking advantage of the festival crowds – product promotions, advertising stunts, extravagant parties, exclusive dinners on yachts or dozens of charity events, led by the famous AMFAR auction. There are about 25,000 people who descend on this town in May – film professionals, stars, about 5000 journalists, festival-goers, sales people. There are also a lot of people not exactly connected to the film industry: pickpockets, tourists, hustlers, models, students, antiterrorist units, paparazzi, stylists, fans and hawkers of every kind. 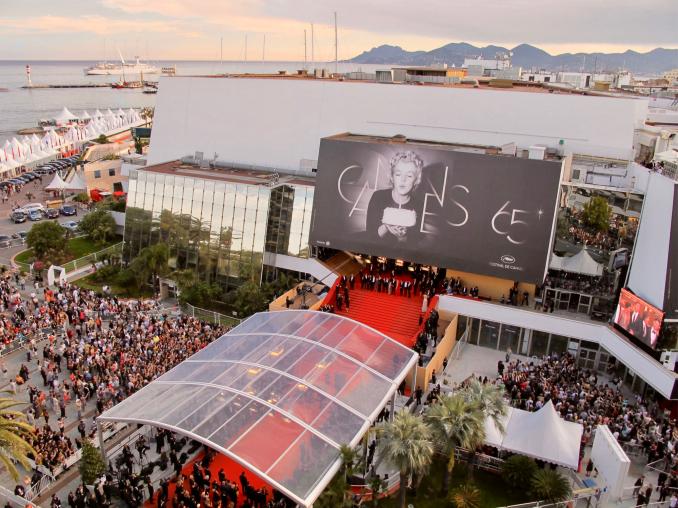 The most visible and most glamorous part of Cannes experience is the film festival itself. The main section is the Official Selection that awards the coveted Palme d’Or, there is also a section called The Critic’s Week (La Semaine de la Critique), another one that celebrates new and unknown directors called Un Certain Regard and one called Director’s Fortnight (La Quinzaine des Réalisateurs) that was originally created to counterbalance the main festival and to show movies rejected by the main competition but in practice this is just another venue to present new movies to the same press that arrives in thousands in Cannes. Around the main competition revolves all this exciting, beautiful theatre of the red carpet that is often seen on television news. It takes place on the stairs of the main theatre called Palais de Festival – this is where film stars have been climbing for decades amid the shouts of hundreds of paparazzi’s. Cannes red carpet is the mother of all the red carpets. Behind the scenes of this spectacle there is a whole industry of film publicists and executives negotiating every second of this activity with the festival officials who guard the event’s protocol. No one who is not wearing a black-tie attire is ever allowed on the carpet – that includes all guests, all security and all press. There is a protocol when and where you get out of a festival car to enter the red carpet, in what order the festival cars will pull up to the stairs, when and who stops and poses for the photographs etc. Selfies are banned. Women are supposed to wear long gowns and preferably high heels. Personal publicists are not allowed to direct their stars in the photo call – this is choreographed by a master of ceremonies. And so on… For each movie in competition, the protocol is negotiated for days between a studio and the festival. Concurrently with the festival there is a trade show called Le Marché du Film where all the independent movies are bought, sold and exhibited to buyers. Sellers – distribution companies, mainly American and English, but there some from dozens of countries – set up offices in a special exhibition area called Riviera- Lerins, or at various hotels and luxury condos in the vicinity. There is a hierarchy there too – the biggest sellers have large offices or market stands in which they receive potential buyers and regular trade partners, discussing prices and upcoming slates, showing promotional trailers and occasionally inviting them to presentations and events. Smaller sellers showcase their movies out of rented apartments that often double at night as bedrooms for the attending staff. The two circuits – official, star-studded festival screenings and the business-oriented film market – run concurrently but they seldom overlap. The separation of these circuits is reflected in the very geography of Cannes. The main, most prestigious street is called Boulevard de La Croisette and it spans a little over a mile alongside the Mediterranean with one side full of beach restaurants that have set up tables directly on the sand a few feet from water. La Croisette’s sidewalks normally serve as a beautiful promenade area but during the festival they are crowded day and night with film executives running to meetings, premiere guests rushing to screenings, and throngs of tourists and fans hoping for a glimpse of the rich and famous. 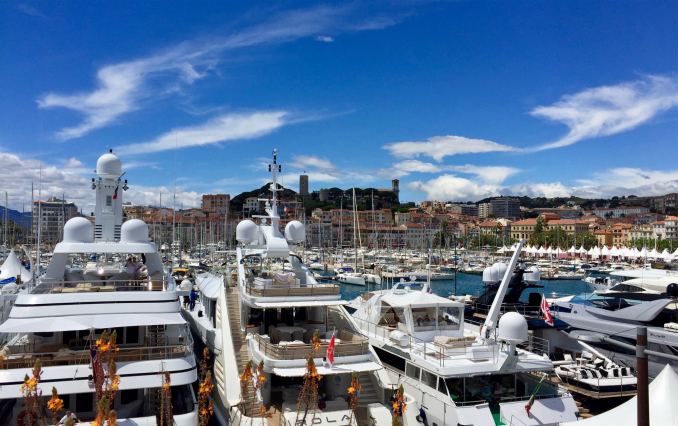 The far side of the boulevard is lined with five star hotels and designer boutiques and it leads to an old port where all the beautiful yachts are parked. This stretch of Cannes is also the road that every film star traverses on the way to a premiere of their movie. Right behind La Croisette there is a row of second tier hotels and apartment blocks, all abutting Rue d’Antibes, the most commercial street in Cannes, lined with fancy boutiques. A few days before the festival, prices in those boutiques are a more less the same as in other parts of France. The day before the festival starts, they go up overnight by 50%. That’s how you know that the festival is about to start. This is also the area where little cinemas showcase movies selling at the film market, terraced condos are rented out as offices to film companies and hundreds of tiny restaurants are packed to the gills with people meeting over a salad and a plate of French fries (the real ones). If La Croisette is the glam street, Rue d’Antibes is the working street. Right behind Rue D’Antibes, there is another row of small streets. These are mainly frequented by the locals and relatively few festival guests stray there. This is where residents buy their lunch meats and vegetables and local brasseries sell cigarettes and afternoon drinks to people who actually make all the hotels, restaurants, deliveries and plumbing work. Cannes has its own rhythm throughout the day. Early in the morning, the only people up and about are street cleaners and some misguided American executives visiting for the first time. Cannes does not do mornings. People have to recover from late night partying or intense sales negotiations or doing publicity events. A lot of them do not even spend the night in Cannes if they have been tucked in some hilltop villa, at a yacht or at the Hotel du Cap. By mid-morning, all the cafes are crammed with people and the narrow sidewalk of La Croisette is impassable. If you work in LA, NY, Paris or London, chances are that by the end of the festival you will have met all your business contacts from your city on that sidewalk. Lunch is usually a working affair for those who are meeting with potential sales partners or discussing a new project, or doing a press interview. This being Cannes there is no reason to rough it up and business is conducted at sunny beach restaurants and elegant hotel bars. In the afternoon, the pace quickens – anybody who came to Cannes to buy, sell, promote, finance, appear, show or present is now going full steam – publicists are running press junkets all over town, stars and their significant others are grooming for the red carpet, sales people are closing pre-sales over the tenth cappuccino of the day, security people are haggling with the Palais staff over access to the festival stairs, restaurants are setting up décor and tables for all the official dinners and parties that night, fans and tourists are on sidewalks trying to spot a celebrity in a festival car, journalists are juggling two screenings and five interviews all over Cannes and buyers are running up and down rue D’Antibes trying to see two movies within one hour. This is a true Cannes moment and relatively few people are actually watching movies. The press would have seen this day’s competition movies in the morning. The lucky people who scored tickets to the evening premieres will see it in the evening – there always two, sometimes three premieres each night. Afternoons are for work and the astronomical prices of everything in Cannes do not justify much leisure. The evening is different for the two circuits. Marché buyers and sellers, thousands of filmmakers looking to finance or promote their projects and partygoers looking for fun events – they all depart for dinners in restaurants around town, parties on the beach, on boats or at private villas. The competition crowd – studio executives, publicists, security and drivers, groomers and of course the actual stars, producers and directors are all in a full red alert mode. For a film delegation that brought their film to Cannes, there is nothing more exciting and more stressful than the premiere night. After months of preparation, negotiations, creating and breaking huge budgets, organizing every detail that will then get erased at the last minute by rain or a new anti-terrorist regulation, this is finally their moment in the sun. If the delegation is lucky, it will not rain, a Valentino dress flown from Paris or Milan catwalk has not been lost during an Air France strike (happens almost each year) and the order of 15 festival cars has been approved by everyone in sight. Everybody finally departs for that magical red carpet photo call. The screening that follows can sometimes be a bit of letdown- the audience may not give it an ovation (boos happen to one or two movie each year) and there is no press conference afterwards. The film delegation moves on to a dinner honoring the movie, often ending the night at the most exclusive hotel of Cannes that even is not in Cannes- it’s the famous Hotel du Cap about 20 kilometers outside the city. What happens in Cannes… never stays is Cannes. If you managed to sell your movie to dozens of distributors from Malaysia to Lithuania then you now have money to actually make your definitive sci-fi-comedy/ horror with two actors from a Netflix special last year. If you are a lucky director whose movie was shown in competition, your contact list is now bulging with names of every producer and actor on a planet. And if you were lucky enough to take a speedboat ride to the Hotel du Cap, followed by champagne on the terrace of Eden Roc restaurant – you will never be fully satisfied with a cup of coffee at a Starbucks during the American Film Market.